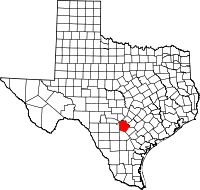 Bexar County is a county in the U.S. state of Texas. In 2010, 1,714,773 people lived there. The county seat is San Antonio. The county has a total area of 1,256 square miles. It is in south-central Texas. In 2010, there were 1,714,773 people living in Bexar County.